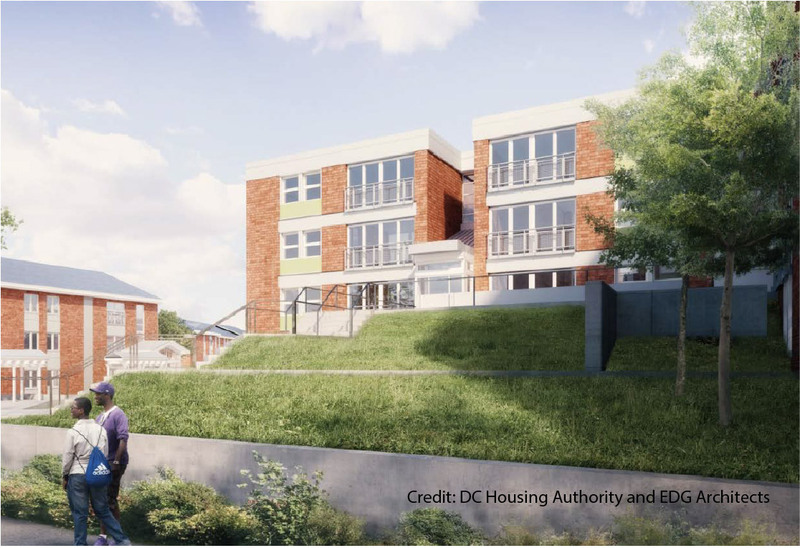 In 2017, Urban Ingenuity was engaged by the DC Housing Authority to support solar analysis for a vacant affordable housing development slated for redevelopment. The project spans eight buildings and a community center across seven acres in Ward 8, adjacent to the former St. Elizabeth’s campus, and will put 220 units of affordable housing back into service upon completion. With substantial amounts of unutilized rooftop space available, in addition to a tract of vacant and unusable land where a ninth building was demolished to accommodate a DC Water access point, the potential for solar PV appeared substantial. Urban Ingenuity and partners provided solar site analysis, project definition, and technical specifications in order to provide DCHA with sufficient information to integrate a district energy system into their existing building plans and bid package for a general contractor. In addition, the team conducted a preliminary review of regulatory approaches and developed initial financial models and financing strategies to allow DCHA to understand the economics of the system under different financial scenarios, and to begin integrating the project economics within the overall project financial planning and underwriting. The result of the UI technical analysis was the development of a system design and preliminary financial modeling for a 630 kW solar PV system paired with about 600 kW / 600 kWh of battery storage – one of the most robust solar installations in the District to date and likely one of the first uses of battery storage in a multifamily context.